Haven't much been into weaving lately... I hurt my back lifting a piece a paper and the pain seems to have sapped the creativity and drive right out of me. 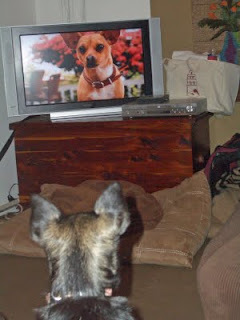 But on a more positive note, my DH and our dogs sat down to watch Beverly Hills Chihuahua last night. Tippy, our three year old chi/min pin. mix was absolutely fascinated for about 50 minutes and then slept through the remaining 40 minutes. We also have a chihuahua that looks just like the one on the screen. LOL. Bummer about your back! I hope it feels better soon!! (And don't you wish you'd hurt it doing something more spectacular....ice climbing or ballet dancing or something!? Our dog doesn't watch TV much, but sometimes if a nature show has animal sounds he gets really interested. Then barks. Not so fun! Lifting a piece of paper??????????? I assume that was the straw that broke the camel's back.....well, your back. Been there more than once. I empathize. Take care and don't get started back too quickly.